Long time readers of this website will know that I've been chomping at the bit for a new Tenement album for ages. Pretty much since the day after their prior effort, Napalm Dream, was released. I've been singing this band's praises for quite some time and they've finally come out with their new record...and it's a double album to boot. In the past I have often compared Tenement to a poppier and more exciting to me version of Dinosaur Jr. They've always had the hooks and searing guitar solos to go along with it. Predatory Headlights is something of a new direction for the band. While you could have certainly seen this album coming if you were paying attention, it still comes across as somewhat surprising. While this is a double album clocking in at just a tick under 80 minutes, there's probably only a single albums worth of straight ahead rock songs. Much like the album's artwork, there's a lot going on during the course of this record. Also like the artwork, it's a bit of a collage of sounds. In addition to some rock, there is real diversity on this record. You're going to get some jazzy interludes, some experimental noise meanderings and a couple of atmospheric soundscapes. You could argue that these excursions add to the album and you could argue that they detract from the guitar focused rock songs. That's going to be the opinion of the individual listener. For me, I don't listen to much in the way of jazz and I can't say that jittery experimental is typically my bag either. I find myself sitting through the chaos waiting for some more rock, but individual listener milage on these songs may vary. As far as the rock, there is a very strong album's worth of material on Predatory Headlights. You could argue that in some ways these songs are more straightforward than what the band has released in the past. There aren't too many of the screaming guitar solos that Tenement has used in the past and there also isn't much in the way of cutting, energetic punk rock. These songs tend to be more mid tempo in nature and the focus is much more on the chord progressions and the vocals. In particular, there's some insane backing vocals going on throughout this album. We're talking high pitched full on Bee Gee's style harmonies weaving in and out of several songs. Honestly it sounds incredible. On paper, that may not sound like something you'd want to hear, but within the context of the songs, the vocals just sound amazing. You'll also hear a solid amount of keyboard and other complimentary instruments that do a great job of augmenting Tenement's songs and adding new layers of depth to everything. I can't help but think this is going to end up as something of a polarizing record. 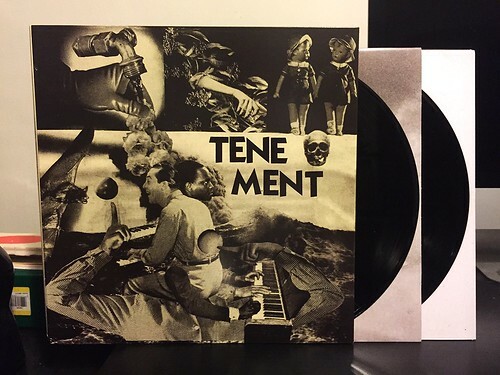 On one hand, you've got some really incredible new Tenement songs. On the other hand you've got a whole lot of new and unexpected sounds to try to process. In the end, I think this is a good album and as a piece of music, it works. But I admit that I would have been content with a single album's worth of rock and roll. In some ways it's going to depend of how adventurous you are.